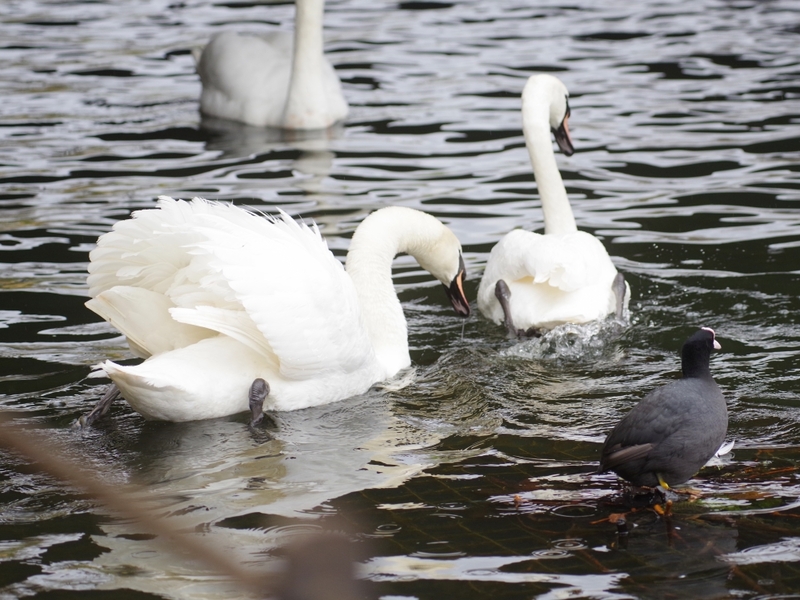 ... but in the end it didn't have to, as the dominant swan turned up and sent them both packing. 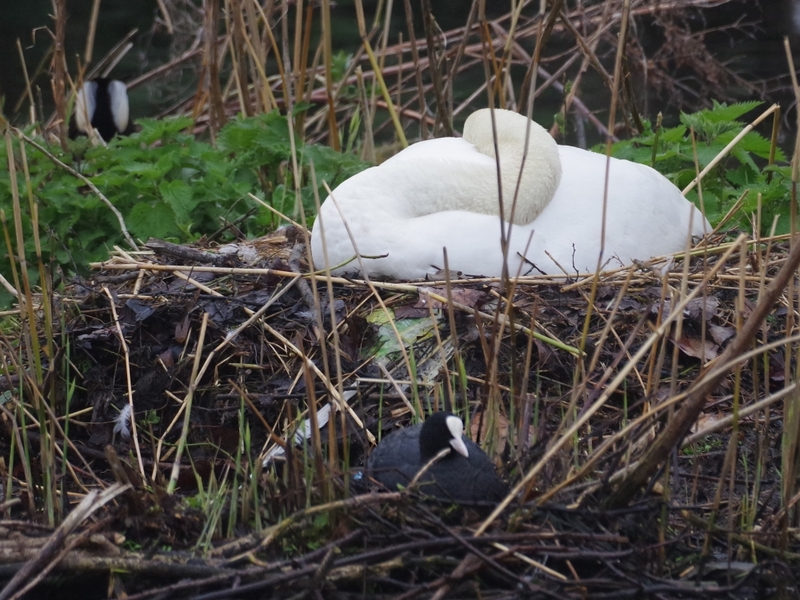 The female swan of the Long Water pair is now definitely nesting, and has been on the little island for three days. 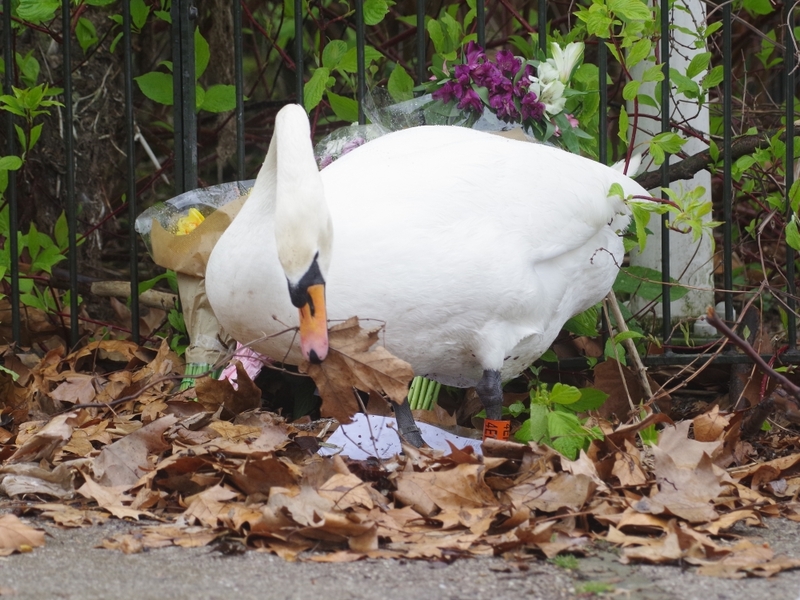 At the Lido, a swan desperate for a nest site was arranging leaves in a hopelessly public place. 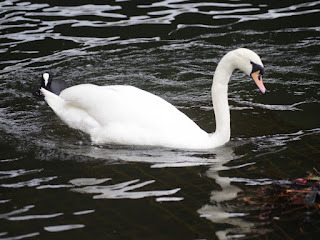 The bunches of flowers are nothing to do with the swan. They are a human memorial. 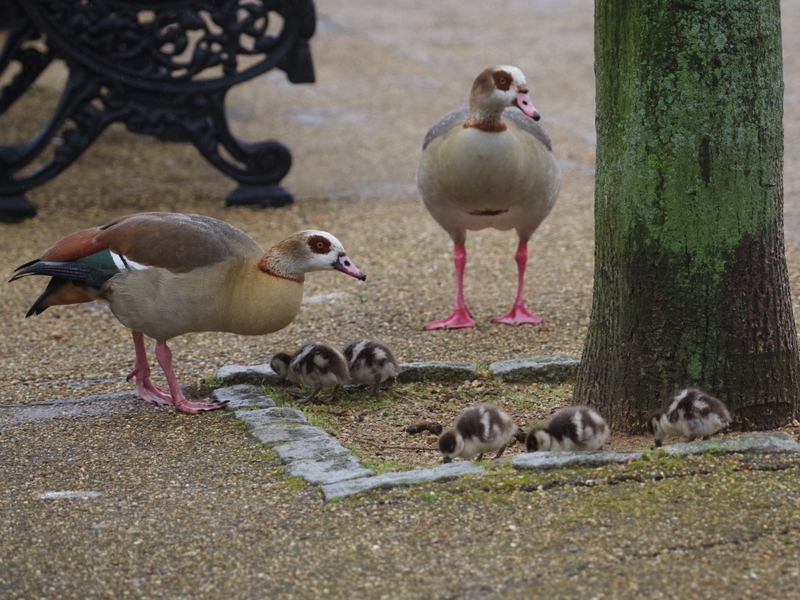 The Egyptian Geese with five goslings were eating the scanty grass under a tree opposite the Serpentine island. 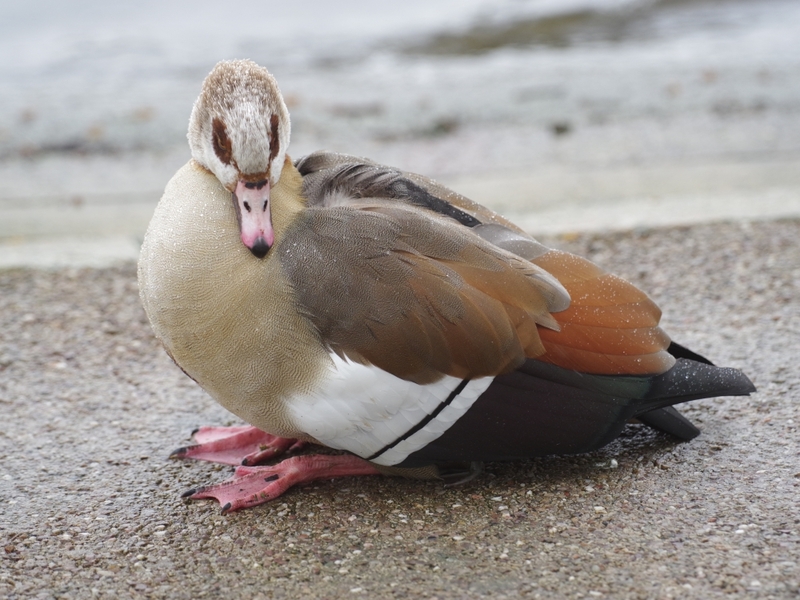 They didn't dare to go farther ashore on to the turf, as even on chilly wet days there are irresponsible people with dogs off the leash. The Egyptian with two was sheltering them from the rain. 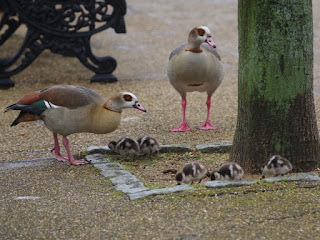 I didn't see the third family. A pair of Mandarins wandered around beside the Serpentine, looking for food. 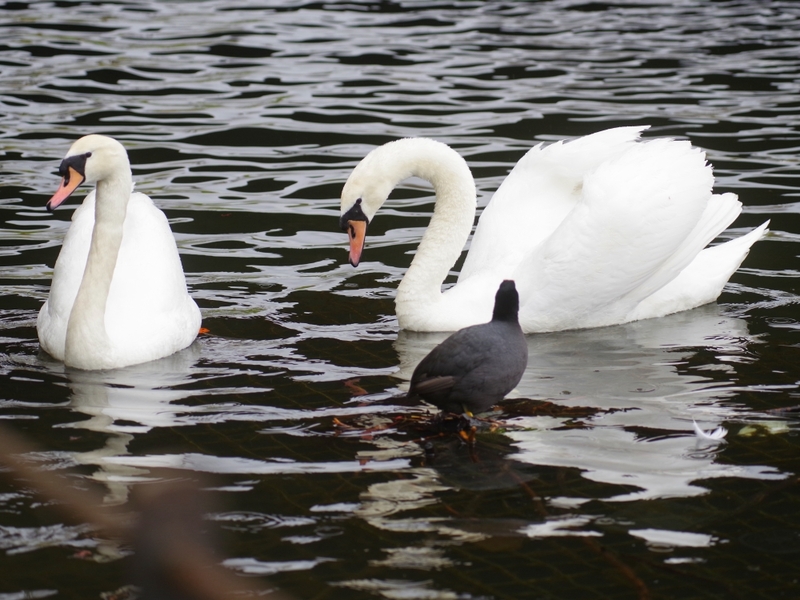 They are omnivorous, so this includes any insects or worms they find in the grass. Another pair prospected in the shrubbery at the northeast corner of the bridge. 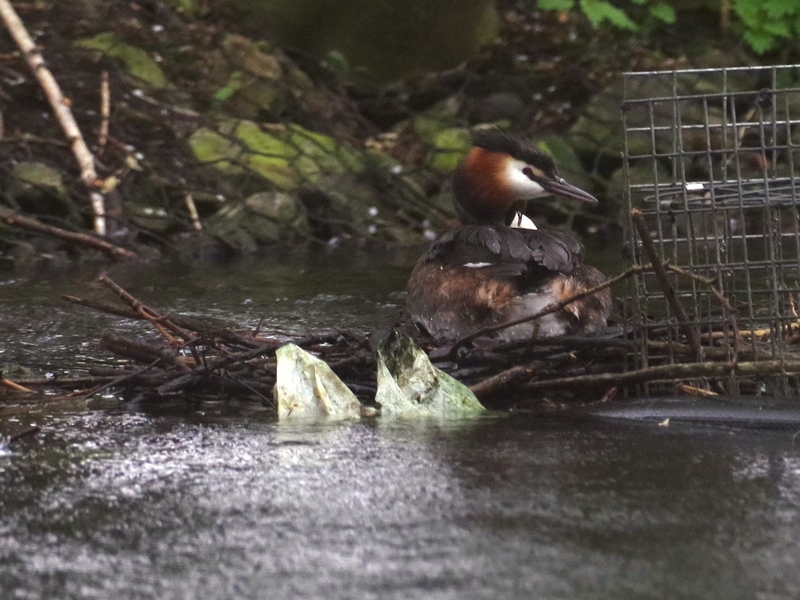 A Great Crested Grebe sat on the nest attached to the baskets at the west end of the island. So far this ramshackle structure is holding together. 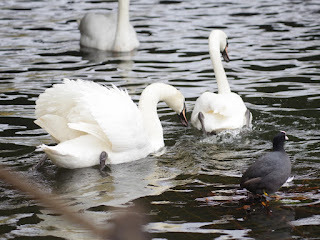 A Moorhen foraging on the edge of the Serpentine was ruffled by the breeze when it turned downwind. 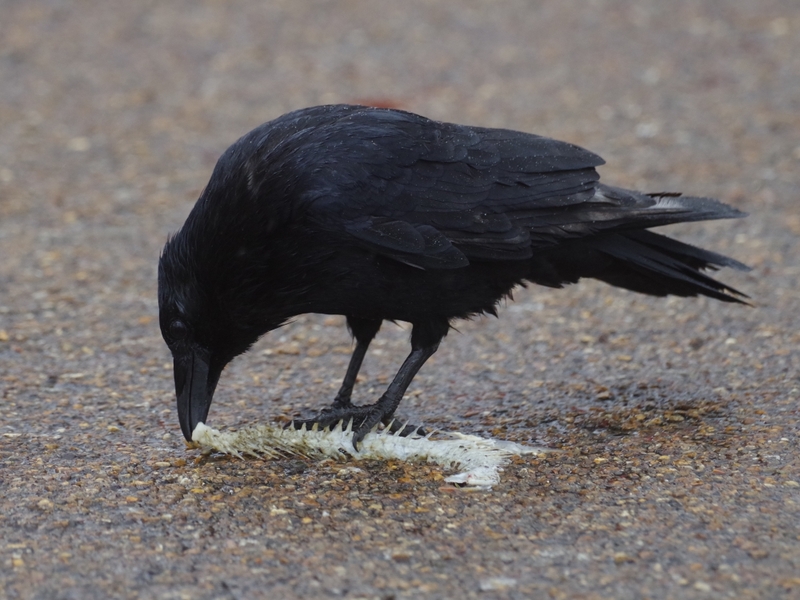 A Carrion Crow was picking the last shreds off a fishbone near the Dell restaurant. It had probably been a meal for the pigeon-eating Lesser Black-Backed Gull, who was standing nearby, with his mate in the water a few feet away. A female Great Spotted Woodpecker called from a tree beside the Long Water. 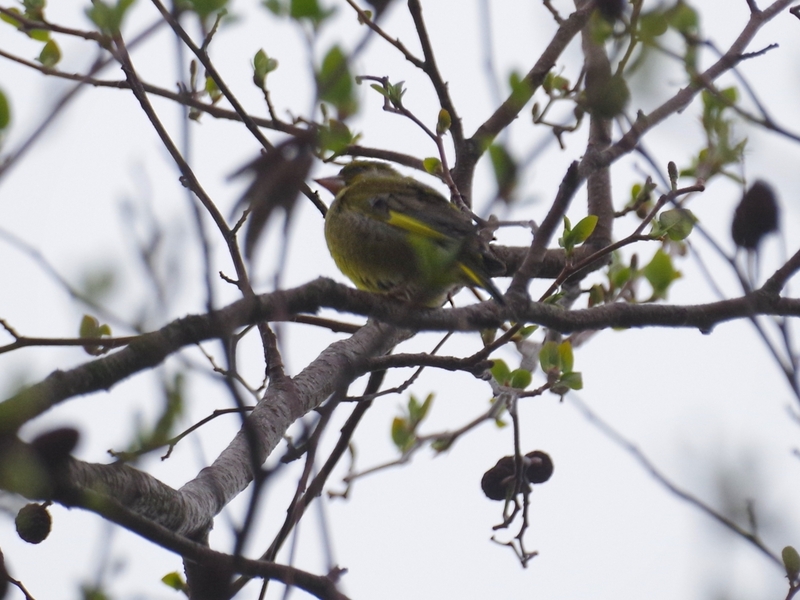 Greenfinches are now a rare sight in the park, but there was one singing in the top of an alder tree near Peter Pan. 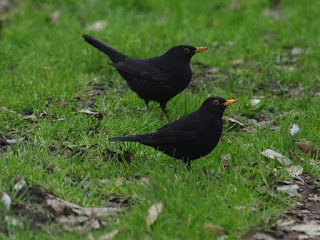 The rain had brought up plenty of worms for the Blackbirds, and two males were foraging side by side, too busy to chase each other. 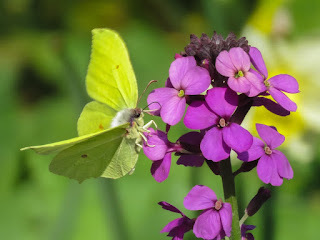 A bit of colour on a dull day: John Ferguson sent a picture of a Brimstone butterfly in Kensington Gardens. 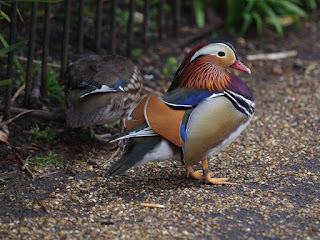 They're very active creatures, and it's an achievement to get a picture of one standing still. Those coots nest-building on the baskets were still pecking at the swans and looking for material when I passed a few hours later. Since there weren't many floating twigs around I threw a few in to see what would happen and the coots snapped them up immediately, all except the pieces of reed. No feeble reeds for these master builders even in extremis, just sturdy wood. 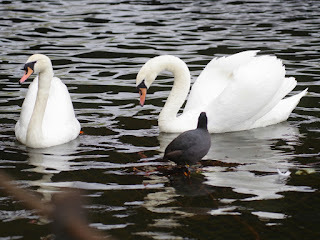 When Coots have got their nests working and are sitting on them, it's fun to throw red flowers into the water -- the colour that Coots love most. 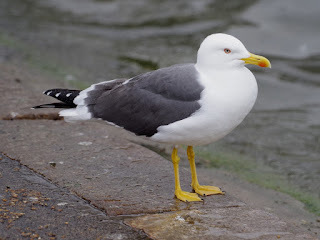 They will seize them and use them to decorate their nest, making a very pretty picture. I'd give much to see a video of that! What are those flowers a memorial for? 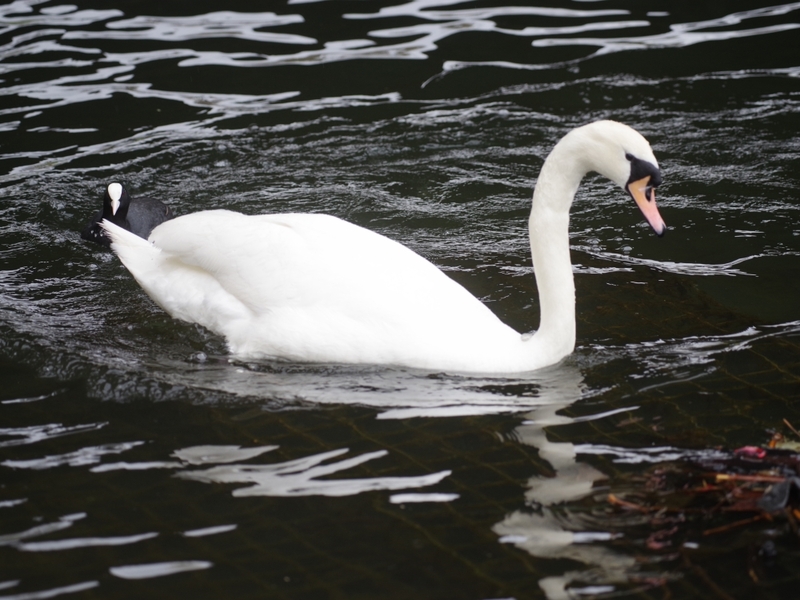 There is something pretty saddening about the desperate swan without a place to build its nest. "The foxes have holes, and the birds of the air have nests; but the Son of man hath not where to lay his head". 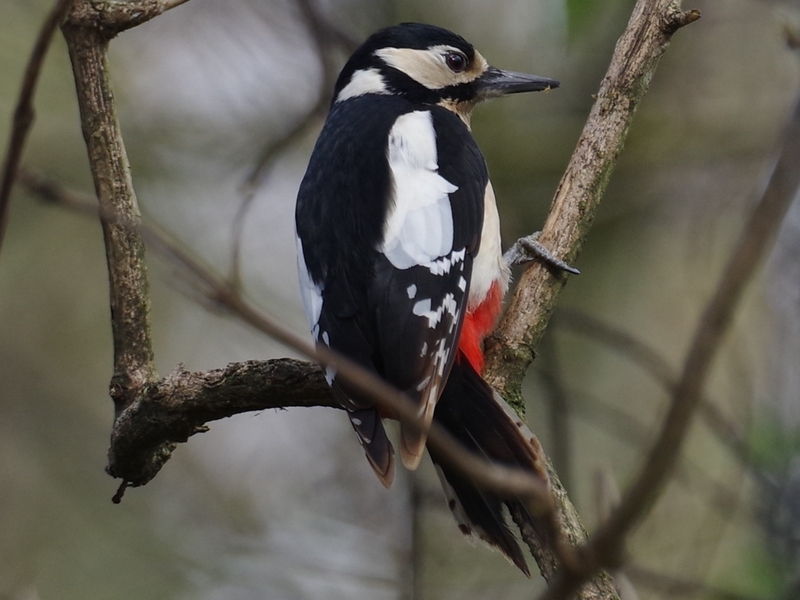 Yes, I'd have liked to have got that on video, but I had my big camera in my hand and it is always ready to go, while the bridge camera I use for video has to be switched on and you lose valuable seconds. There is a habit here, among younger people, of tying bunches of flowers to railings or propping them up against walls near the place where someone has died, or sometimes in the dead person's favourite place even if they died elsewhere. It is sweet and sad. There is a place at the north end of Vauxhall Bridge where you have to sprint with all your might to cross the wide road in any direction, and when I go past, more often than not there are flowers attached to the railings commemorating those who died in the attempt. Westminster City Council, far gone along the Left Hand Path, have not seen fit to install proper pedestrian crossings.